Antique beds are rarely set up for today's queen and king sized mattresses and box springs. Most people want standard queen or king bedding, or at least the old standard, a full or double size. Between 100 to 150 years ago, before fitted sheets, the exact size of a bed and mattress wasn't so important. The average height was much shorter, and beds could be any size with feather beds or home-made mattresses. In the 1890's, manufactured bedding appeared, and the standard double or full size was around 72" x 52". Antique dealers refer to the older, smaller-than-double size beds as "three-quarter", although they can vary a great deal in size. Complicating the issue are European beds, built to entirely different dimensions. The common problem is how to enlarge an antique bed to a modern desirable size without ruining the proportions and appearance of the original bed. Our cabinetmakers have done conversions for many years. We utilize standard brown steel rails for either full/double or queen/king length. 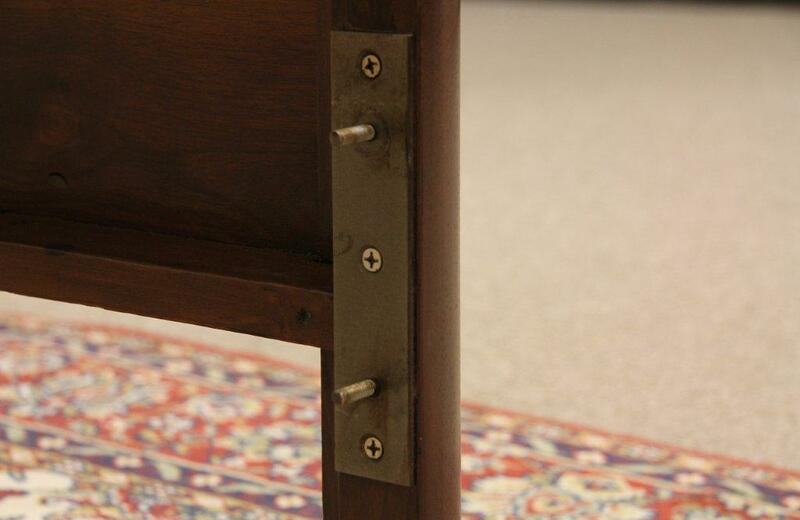 We attach these rails to the headboard with bolts that go securely through the headboard itself. Sometimes, we need to add a sturdy piece of wood to have a secure place to bolt the rails. 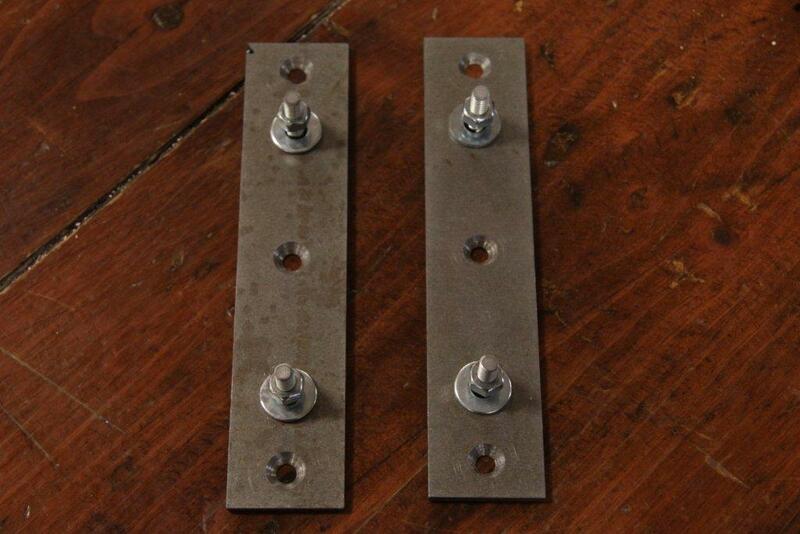 At the footboard, we attach a rugged steel plate fitted with welded-on bolts. (We have never been able to find such plates, so we designed them and have them fabricated in a machine shop.) This application is done on the inside of the footboard so nothing shows from the outside. This enables the steel rails to be attached very securely with nothing showing on the outside of the antique footboard. 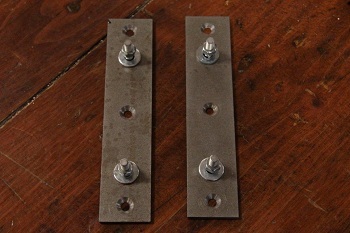 The bed can then be set up and taken down repeatedly by simply unscrewing the nuts and bolts at each corner. Sometimes on narrower beds, the steel rails are flipped "upside down" so that longer 1" x 4" wooden slats can be set on them to support the bedspring and mattress. 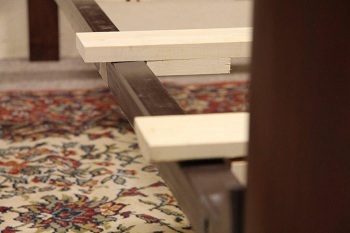 Small nails hammered upwards through the slat into the wooden frame of the bedspring will prevent the spring unit from sliding around on the frame. If it is ever decided to return these "converted" beds to their original sizes using the original wooden rails, the steel fittings can be removed with no visible damage to the bed itself. Another factor in using antique bed frames for modern standard bedding is the thickness of springs and mattresses. Most bedding stores love to sell very thick or "pillow-top" mattresses that can be too tall and cover much of the beautiful old headboards. If more of the headboard should be showing, thinner mattresses and springs should be ordered from the bedding store. The point is to measure from the steel rails up to the desired top of the mattress to determine what thickness would be ideal before ordering a new mattress. The eventual appearance should be as planned, not the surprise of a foot taller than expected!